With newly installed Honeywell Remote Thermostats, you will never arrive to a freezing cold unit. Wake-up with a beautiful unobstructed view of Mount Snow... sip on your coffee or espresso and get ready to enjoy the day. Walk to the slopes, or take the shuttle that runs every 20 minutes to, and from the immediate base-area. Either way, you'll be on the slopes in minutes. The upstairs bedroom has a king-size bed with a bathroom. A 32' LCD TV is also located upstairs with full premium cable. The downstairs bedroom has a queen-size bed along with two bunk-beds. The living room has a brand new 40' Sony LCD TV with a Blue-Ray DVD player. There is also a Bluetooth compatible Bose SoundLink-Mini for those impromptu Apres-Ski Parties! There is also Wi-Fi in the unit. The kitchen is fully equipped with all new appliances, coffee-maker and a LaVazza espresso machine with espresso pods provided. There's a great little market just down the road, and you can cook dinner in if you like as the kitchen is fully equipped. I really went all out with this place and it shows... it’s there for you to enjoy! I live in White Plains with my family and have been coming to Mount Snow for over ten years... I have a love-affair with this mountain, and finally found my dream ski-house which is my pride-and-joy. A short walk, or shuttle to the mountain with a full amenities center which includes an indoor hot-tub, sauna, tennis courts, and exercise room to-boot. 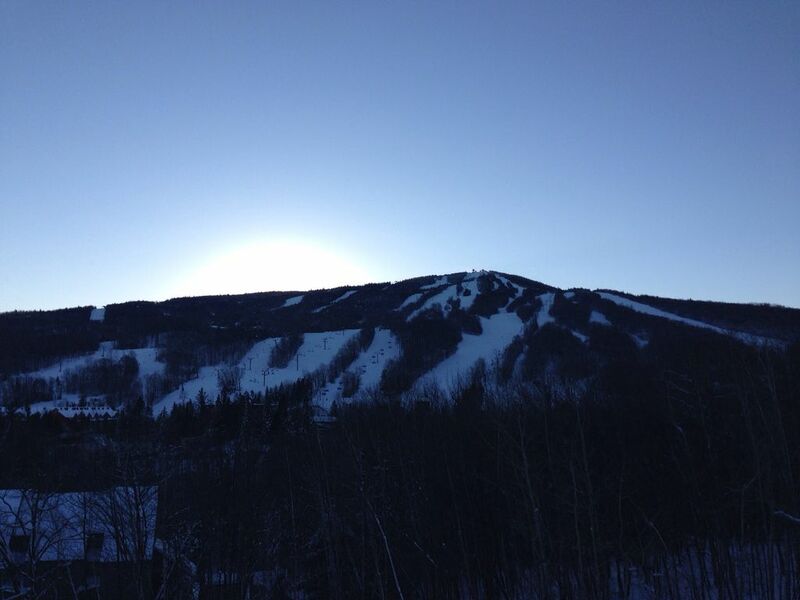 A 'million dollar' unobstructed breathtaking view of Mount Snow...watch skiers, hikers, and mountain bikers go up and down the mountain with incredible sunset views! Honeywell Remote Thermostat allows me to warm the unit up prior to your arrival. Coffee Maker & Espresso Machine on-site! We enjoyed our stay at Mount Snow. The condo is cozy and felt like home. Lenny was super responsive when we had questions and we will definitely be back. Lenny’s condo was the perfect spot to land during our ski getaway at Mount Snow! Easy to store our gear in the ski locker when we arrived, we could then be cozy and comfortable once inside, with plenty of space to relax, lounge, dine, spread out and gaze at the mountain views out the large windows. We’ll certainly return! Thank you for your kind words Amy... hope to have you back again sometime soon! This place has it all, comfort, tech for the young adults and peace and quiet for the older adults. For us as skiers it was perfect. Not only did we get a great view of conditions and weather, we could see the crews prepping the mountain as well. Thanks for sharing this wonderful spot. Both my wife and daughter cannot stop talking about it. Good location, well kept and comfortable. Espresso machine and pods a nice touch. Midweek stay at Mt. Snow. Beautiful view, well maintained, comfortable and quiet condo 4 min drive to slopes. Owner is very responsive and a pleasure to work with. Nearby hottub & sauna was also nice. Lenny's place is great! Close to the mountain and very cozy. We had a great time there! If you use the "Book Now" feature there is a 2.5% service fee.